Tilted Horizons: New TV show: "Sons of Anarchy"
New TV show: "Sons of Anarchy"
Wednesday, September 3rd at 10 PM ET/PT, we are launching a new television show called Sons of Anarchy starring Katey Sagal (The Shield and Married with Children), Ron Perlman (Hellboy) and Charlie Hunnam (Queer as Folk). This brand new drama explores a notorious outlaw motorcycle club’s desire to protect its livelihood while ensuring that their simple, sheltered town of Charming, California remains exactly that: Charming. It is action-packed, full of bikes and well…it’s one hell of a ride! 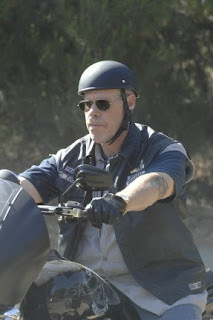 For more information, go to http://www.fxnetwork.com/shows/originals/soa/#Nav/Homepage.